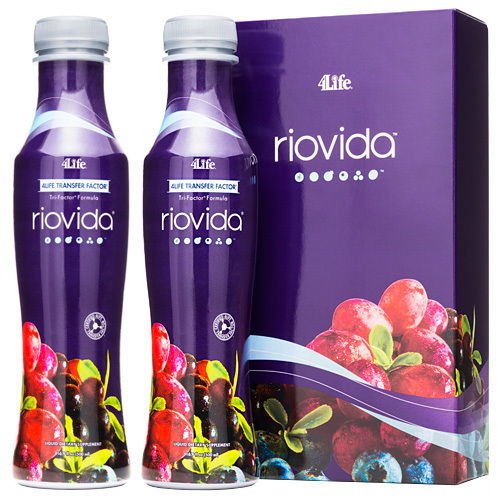 RioVida is the one-and-only juice beverage in the world that provides the benefits of 4Life Transfer Factor Tri-Factor™, Açaí Berry, 100% Juice Blend and the World’s Most Powerful Antioxidants – in a Great Tasting Drink! Just One Ounce a day provides Powerful Immune Support, Anti-Aging Benefits and Increased Energy. Patented, Proprietary and Proven. Improve your Health Today! This revitalizing antioxidant juice beverage is breaking traditional rules and creating a new juice category of its own. 4Life Transfer Factor RioVida is the very first beverage of its kind, combining the potency of Transfer Factor Tri-Factor Formula with fruits bursting with antioxidants. Transfer Factor Tri-Factor combines polyvalent transfer factors from both the cow and chicken for synergistic and concentrated immune system support. Get your daily rush of vitality with RioVida! Provides the proven immune system power of 4Life Transfer Factor Tri-Factor Formula in an easy to drink, great-tasting juice beverage. NanoFactor™ extract is 4Life's patent-pending extract of immune-enhancing nanofractions. It helps fine-tune immune system function so that immune cells know when to act, how to act, and when to rest. 4Life Transfer Factor products are featured in the Physicians' Desk Reference For Nonprescription Drugs and Dietary Supplements since 2002, the standard supplement guide for physicians that can be found in physician offices, hospitals, and pharmacies throughout the United States. Lactoferrin supplies vital milk proteins that support the immune system.